The word Contemporary is used quite often in design language & it is implied that we all know what that means. But where does it actually fit with design styles? Most people mix Contemporary & Modern, as both words came into the Interior Design vocabulary for the everyman at about the same time. However they are very different. Modern design refers to architecturally designed spaces, with sleek, straight lines, plenty of gloss & a minimalist feeling. Whereas Contemporary Design is what is in vogue now. This makes it fluid & ever changing. 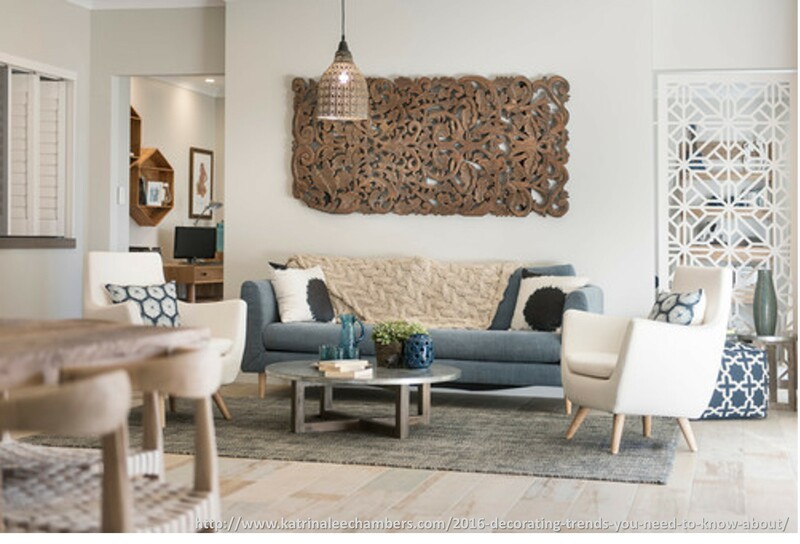 Currently, Scandinavian styles, Industrial design & now Tribal are becoming the main stream trends, so these elements are all seen in Contemporary homes. The simplicity & structural nature of Modern continues to be seen, but Minimalism is out. Contemporary now includes bleached timber legs on high raised furniture & white based colour schemes like Scandi, teamed with exposed beams or metal lighting fixtures from Industrial, while still having sleek, straight lines from Modern. Rattan baskets or textured rugs stick to the Tribal with Bohemian styled patterns. Contemporary is a much easier style to replicate in your home than many others as it is purely a mixture of pieces. This means you can pick your favourite elements from each style & incorporate them into your palette. When you get tired of it, or one elements becomes out of vogue, you can update or replace those pieces without having to change the whole design. Contemporary is also what is currently seen in décor stores, which makes it easy to shop for. One of the concerns with Contemporary are that it is hard to always keep up with the current trends. This is where it may be better to invest in larger pieces, such as expensive furniture or an all-over colour scheme, in a simplistic style which can outlast the current trends. This may mean a light overall selection & updating the decorator items & cushions as the trends change. The other issue with adding multiple elements into a room is making sure that they all work well together, especially when they are a combination of different styles. This is where it is best to think about the room. If the colours balance, what you want to draw your attention to, & if that combination of pieces gives the overall feeling or flow that you desire. The best part about Contemporary is it is always fresh. It may have parts of the old, but with a new way to look at it. Which means your old items could gain a new lease of life & look brand new.